On March 26, 2012, the FDA approved of a new type of steroid nasal spray in the treatment of nasal allergies that puffs powder into the nose rather than a liquid. Liquid formulations such as nasonex, flonase, veramyst, nasacort, and rhinocort has been until now the only delivery medium of administration. This new spray made by Teva Pharmaceuticals is called QNASL which puffs a steroid beclomethasone dipropionate. 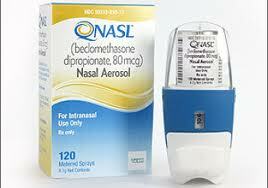 For those who know pharmaceuticals, it is the same active ingredient as (liquid) beconase nasal spray. Just like the other nasal sprays, administration is 2 puffs (sprays) in each nares daily. This spray does pretty much the same thing (and has similar side effects) as the other established nasal sprays. However, QNASL may be better tolerated in those patients who HATE the drip down the back of the nose after liquid nasal spray use. Drug should be available for prescription starting in April 2012.